Apple has reportedly signed a lease for a 770,000-square-foot campus to be built in Sunnyvale, Calif., a stone's throw away from its Campus 2 "spaceship" currently under construction in Cupertino, expanding the company's already substantial presence in the area. According to the Silicon Valley Business Journal, Apple inked a deal with Landbank Investments LLC to occupy the firm's forthcoming Central & Wolfe campus. While terms remain unknown, the publication believes Apple chose to lease, not buy, the development. A website set up to showcase approved building designs reveals three organically shaped, multi-story structures that connect around a central courtyard to create what looks like a three-petaled flower. It is not yet known if Apple intends to stick with the proposed architecture, but as it stands, the design can support up to 3,000 employees. In keeping with Apple's eco-friendly image, plans for the Sunnyvale campus call for small parks, walking paths and wide open spaces populated by local flora. 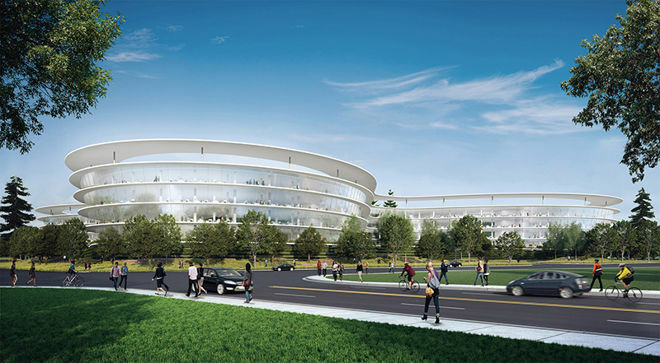 Workers will be able to look out on the green expanse from curved windows reminiscent of those used in Campus 2's disc-shaped main structure, a striking design that has been coopted to some extent by major tech firms building out new Silicon Valley headquarters. Developers have not yet set a concrete construction timeline for the Sunnyvale complex and it is currently not known when Apple plans to move in. Interestingly, the Central & Wolfe project is located across the street from a seven-building development Apple is already leasing. That complex, called Sunnyvale Crossing, is comparatively smaller at about 290,000 square-feet and can reportedly accommodate some 1,450 workers.